Printing a document is highly needed after creating a document or after saving a document. There are many things to consider in our documents , one of that is the spelling and grammar or it is communicative. And sometime there are documents came from the internet that we need to convert in word processing version, like the Portable Document Format (.pdf) if ever we need it in our document. Now, after this document created in our document template in word processing, there are things that we need to consider before to make a hard copy on it. Because there are many document as of now that it is highly graphical. Like for example, a magazine like document that it have a color background or graphical background. Like the picture, pattern, or a gradient color. Another is the certificates that the logo of a company or schools is background of that certificates or we called water mark application using the different versions of the word processing. If this document is like what I said here, then you print it, you will wonder why during the printing there no colors or background was printed. And this is what I need to impart here in this post. Print documents either colored images and background or grayscale printing. 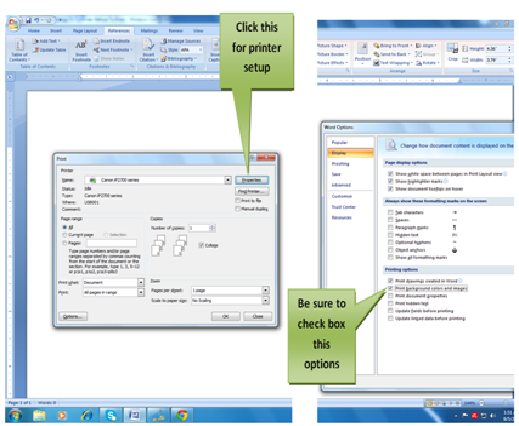 Print document from last page to 1st page using your printed setup menu. Follow the instructions below of this post, so that you will learn how to print your document correctly. 1.) Print background colors and images- set the printing options before to print document. How? Use control key then press P or click file menu button. Then click it, another windows will display in your screen, look for the printing options. And you will find a check box options. Be sure to check box the two options called “print drawings created in word” and “print background colors and images”. In a window display, click the button called “properties” beside in the name of your printer position at the right side. 3.) Print document from last page to 1st page using your printer setup menu. Another window will display, click the menu called “Page Setup”. Locate the checkbox called “Print from the last page”. Position at the bottom of that window. Now, you’re done to setup the printer before to proceed for printing a hard copy of your document.